Alcohol abuse is very prevalent and a potent problem for many Sri Lankans, but what really fuels its cause and what we prescribe as remedy is far from what is posed for public discourse. Over the course of the last six months, as part of our ongoing research centring on the economic and social prospects for women, we had the privilege of engaging over 3,000 families in various parts of Sri Lanka and alcohol has a significant impact on their quality of life and livelihoods in various forms. To begin with, 68% of households admitted to consuming some form of alcohol – men and women included – of which 96% consume spirits. A considerable number of rural, suburban and working-class women brew and consume alcohol – illicit alcohol – and these alongside many other relative elements form the basis for work, life and culture for many Sri Lankans. These ‘hard truths’ are what we famously ignore; shun them as untruths not befitting our conceited cultural and religious fronts, and it is our inability as leaders and as citizens to accept them and do what is right that will perpetuate this issue of alcoholism to incurable highs. Of these 3,000 families, 2,056 (69%) admitted to consuming alcohol. Of these 2,056 families, 84% consumed only spirits and potent illicit alcohol, with illicit consumption estimated to be 43% out of that number. With 5,000-plus more families to be surveyed, we envisage that these numbers would grow. Safer softer alcohols were hardly spoken of, so let us delve deeper as to why. 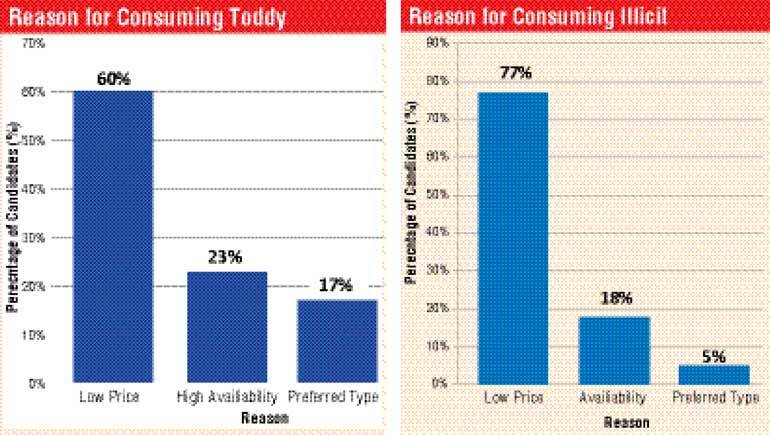 Based on the feedback received from respondents, price and availability is what drove consumption. Over 60% of toddy consumers and 77% of illicit alcohol (kasippu) consumers chose these products as they were the cheapest alcohol products available within reach. A cup of toddy sold for as low as Rs. 50 in some parts of the country, whilst a bottle of kasippu was available for as low as Rs. 200 in others. The North, North Central, Uva, Central and North-Western provinces have thus far revealed the highest incidence and prevalence of illicit alcohol in the country, with authorities doing and achieving very little to stem the rot. 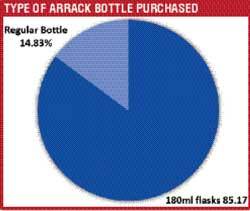 Over 1,900 persons consumed arrack, and 85% of them purchased the 180ml flasks to satisfy their daily requirements for alcohol. Besides price, proximity was a key consideration in the purchase of illicit alcohol. The distance to any illicit or unlicensed toddy outlet was less than two kms for 88% of the drinking population. However, a registered liquor sales shop was on average 10kms away, with no real form of public transportation available in some places. One might raise the question, as to why we have clubbed toddy which is a traditional product, alongside illicit in our description. This is because it emerged that toddy was being produced using unconventional methods to generate volumes, with little or no information of the product or its brewing process. “Look at these trees madam, do you see anyone tapping them? Nothing is happening, but there is plenty of toddy available for sale. We know this is not real toddy, it even tastes different, but it’s freely available which is a good thing,” stated Jayarathne from Kegalle. Accordingly, it becomes evident that the current policy or mechanism has given wing to the illegal industry with ample distribution and availability. Its consequences go beyond the impacts on health and domestic violence, but there are the far more serious implications of organised criminal activity that corrupt and degenerate society and law and order. For instance, with the lack of availability registered outlets, various individuals and groups are seen engaged in the sale of registered and unregistered (illicit) alcohols via mobile outlets. This was very visible in the Jaffna peninsula, Badulla and Central regions, as motorbikes, three-wheelers and cars were used to conduct door-to-door sales in the absence of outlets. Some of the bottles bore the inscription and caps of the reputed manufacturers, but came sans the regular label and with the safety cap broken – “so we don’t really know what we are buying, but we take what they say…” these consumers admitted. From Marathankerny, the closest registered liquor sales outlets is 33km away, whereas the toddy tavern was just a mere walk for many. In the North Central and Central Province, and the Colombo, Gampaha and Puttalam Districts, women brew kasippu (illicit) in their homes for domestic consumption and income, with very little consideration or concern for the desecration of the morals we tend to attribute to alcohol and addiction, plus, scant regard of the law or authorities. “My husband and I have been brewing kasippu at home for over 15 years. We are day wage earners, and this is good for us at the end of a long day and it helps us to earn some additional income. The Police and Grama Sevaka may come, complain and take us away, but we need to live and the people of this village cannot be spending excessive amounts of money to go to the bar. People can say what they want, but we don’t have any problems and it feeds my family,” averred Lalini from Kebathigollewa, echoing the sentiments of hundreds of others. Despite the lower spend on illicit products, on average a family spent Rs. 12,500 per month on alcohol – especially amongst the working-class. The above situations evoked multiple emotions. But the bottom line is that it represents a breakdown of law and order. If unknown individuals can transport and vend unlicensed liquor openly from the back of a vehicle – that represents a problem. There is a problem of revenue lost, a problem of quality and consumer safety, and the problem it poses in terms of disturbing and enforcing social peace and security. If men and women are visibly engaged in brewing and selling illicit liquor and toddy in every district of Sri Lanka – including the commercial capital of Colombo – we have failed to instil justice and rationality into society. These developments are seldom discussed or debated in public, as authorities tend to fight shy of ground realities which are very visible all round. With due consideration to the above facts and observations of ground realities, it is evident there is excessive incidence of spirits and illicit alcohol in our country as it is freely available and affordable in illegal forms. Softer alcohols are considered far too expensive and offer very little value for money, receiving almost no mention. Women are victims of alcohol abuse or addiction, but as alluded before they are and have always been a significant part of the process as producers and consumers. Free Trade Zones also emerged as hot spots for consumption amongst women, who choose to do so discreetly with peers and family. In over 25% of families, women were the primary breadwinner and were often forced to fund their husbands’ consumption needs, which also qualifies as a form of abuse and deprivation. However, only 13.5% of women reported alcohol-related physical or mental abuse whilst we estimate this figure to be at least 35% as societal and cultural obligations prevent them from coming out with the truth. Kasippu is a major threat to law and order and health island wide, and whilst there were various accounts of Police and law enforcement cracking down on dens, they often continue undeterred – some with cover from local politicians. Many illicit and toddy consumers admitted their preference to consume something safer, but lamented the challenges posed by price. Softer, safer alcohols do not qualify for consideration as they are deemed too expensive with little or no value for money. In addition, it emerged that many persons – especially day wage earners – believed that alcohol brought them strength and kept them safe from disease. They also believe that cirrhosis was the only real form of alcohol-infused illness, thus, just 9.2% of respondents reported any poor health due to alcohol abuse. Alcohol presents several challenges and opportunities to Sri Lankan life and society. Whilst we choose to publicly shun consumption and conversation, it is a very significant part of day-to-day life for a clear majority of Sri Lankans, across all walks of life and from all ethnic and religious backgrounds. We anticipate unravelling further data during this research, which we hope would be put to practical use in the hands of authorities and lawmakers. As evidenced in our observations and findings, a safe and practical alcohol culture and policy is necessary for Sri Lanka to boost Government revenue and ensure law and order and safety of our citizens.